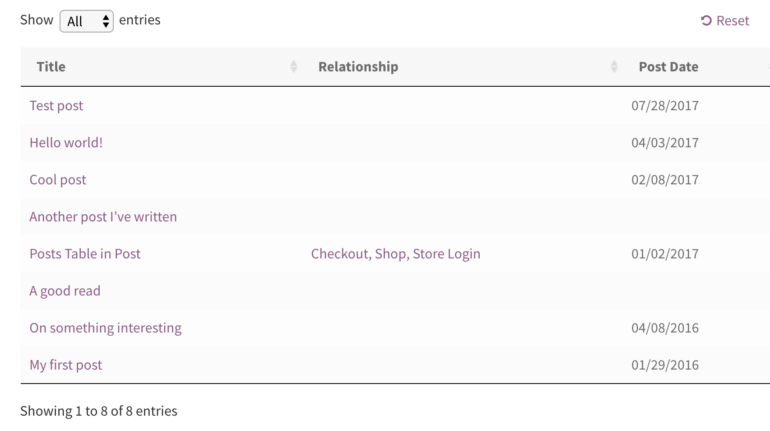 Our WordPress table plugins – Posts Table Pro and WooCommerce Product Table – support Relationship fields in Advanced Custom Fields. How do ACF relationship fields work in the table? Here’s a screenshot of the Posts Table Pro plugin with the relationship field listed as a column of the table. You can see the 3 related pages displayed in the table, linking to the relevant pages. If you don’t want them to be clickable then you can use the links option to disable these links. Is it possible to display parent and child data using ACF relationship fields? Unfortunately it is not possible to display the parent data (i.e. posts, in the example above) separately from the child data (i.e. the 3 selected pages, in the example above). ​The way the plugin works is to retrieve any linked-to posts (including pages and custom post types) and display them as a comma-separated list in the table.